Welcome to the September edition of the Inclusive Growth Bulletin! 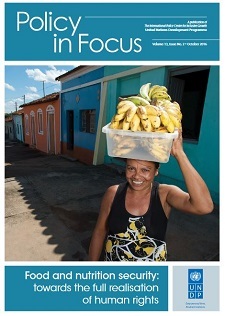 In this issue, we bring you new IPC-IG publications on topics ranging from institutional food procurement programmes to social protection in East Africa. In the Working Paper “Implementation of decentralised food procurement programmes and the impact of the policy, institutional and legal enabling environment: the case of PRONAE and PAA Africa in Mozambique”, authors Luana Swensson and Israel Klug (Food and Agriculture Organization of the United Nations—FAO) seek to assess the impact of legal and institutional frameworks on the implementation of decentralised and efficient institutional food procurement programmes (IFPPs), which aim to link smallholders to institutional markets and promote the development of local food supply systems. The authors analyse how these frameworks relate to challenges and barriers faced by smallholder farmers in accessing IFPPs, in the context of Mozambique’s National School Feeding Programme (PRONAE) and the Purchase from Africans for Africa (PAA Africa) programme. 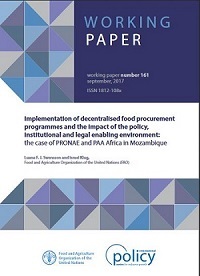 An associated One Pager, “Building a favourable environment for institutional food procurement programmes: contributions from Mozambique”, is also available. PAA Africa began in 2012 as a partnership between FAO, the World Food Programme (WFP), the Government of Brazil and the UK Department for International Development (DFID). It has been piloted in five African countries: Ethiopia, Malawi, Mozambique, Niger and Senegal. In partnership with FAO, the IPC-IG has been producing a series of Working Papers and accompanying One Pagers to present and examine different aspects of the programme across all implementing countries. Previous releases include the Working Papers “Fostering food purchase programmes in widespread poverty contexts: targeting smallholders within the PAA Africa Programme in Niger” and “Targeting farmers in institutional procurement programmes: case study of the PAA Africa Programme in Senegal”. We also invite you to read other key publications on the subject: the One Pager “Phase II of the PAA Africa programme: results and lessons learned” , by Ana Carla Miranda, Mario Gyori and Fábio Veras Soares (available in English, French, and Portuguese), and the article “Linking vulnerable smallholder farmers to school feeding programmes: the experience of PAA Africa”, published in the October 2016 issue of Policy in Focus: “Food and nutrition security: towards the full realisation of human rights”. Two new One Pagers have been produced based on the webinar Social Protection in East Africa: Harnessing the Future, which was organised by the EU Social Protection Systems Programme (EU-SPS) and hosted by the socialprotection.org online platform on 22 June 2017. It was led by Alexander Pick (OECD Development Centre, EU-SPS) and Dr. Flora Myamba (social protection and gender specialist), and moderated by Fábio Veras (IPC-IG). Click here for the summary and the video recording of the webinar. In “Social protection in East Africa: harnessing the future”, Mr. Pick presents the main findings of the report by the same name, produced by the EU-SPS and the Organisation for Economic Co-operation and Development (OECD) on the future of social protection in Kenya, Mozambique, Tanzania, Uganda and Zambia. It examines key demographic, economic, social and environmental trends that are likely to affect the demand for social protection. This publication is available in English, French, Portuguese, and Spanish. In “Workers in the informal sector and contributory social insurance schemes —the case of Tanzania”, Dr. Myamba addresses one of the pressing challenges in the East Africa region: the low coverage rates of social protection in the informal sector. This publication is available in English, French, Portuguese, and Spanish. The One Pager “Impact of the more education programme on education indicators”, by Luis Felipe Batista de Oliveira (Ipea and University of Brasilia - UnB), and Rafael Terra (UnB) is now available in Spanish. This study was previously released in English, French, and Portuguese. The One Pager “Aspects of Chilean and Peruvian safety nets”, by Pedro Arruda and Manoel Salles (IPC-IG), and Luísa A. Nazareno, consultant, is also available in Spanish. It was previously released in English, and Portuguese. The IPC-IG will participate in the International Conference on Social Protection in contexts of Fragility & Forced Displacement, to be held in Brussels on 28 and 29 September. The conference will address three themes: effective social protection in fragile contexts, the needs of forcibly displaced populations and host communities, and the role of social protection. socialprotection.org will livestream eight sessions during both days of the event, from 9:30 AM to 5:30 PM (Brussels, local time). IPC-IG's Senior Research Coordinator, Fábio Veras, will be one of the panellists of Plenary Session I: Social Protection in Fragile Contexts: Lessons Learned and Moving Forward. Ms. Raquel Tebaldi, IPC-IG's Research Assistant, will also participate in the event. Daniel da Mata, Ipea Researcher and IPC-IG Research Associate, presented his paper titled "On the Determinants of Slum Formation" at the 4th Urbanization and Poverty Reduction Research Conference. The event, held in Washington D.C. on 8 September, was organised by the World Bank and George Washington University. Previously, Mr. da Mata delivered a presentation on his paper "Changing the Climate for Banking: The Economic Effects of Credit in a Climate-Vulnerable Area" at the 73rd Annual Congress of the International Institute of Public Finance (IIPF 2017), on 18 August, in Tokyo, Japan. 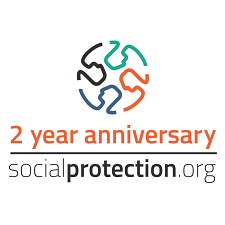 socialprotection.org celebrates its second anniversary this month. The member-based online platform dedicated to issues of social protection is supported by the Development Working Group of the G20, financed by the Australian Department of Foreign Affairs and Trade (DFAT) and the Deutsche Gesellschaft für Internationale Zusammenarbeit (GIZ) GmbH on behalf of the German Federal Ministry of Economic Development and Cooperation (BMZ) and it is hosted by the IPC-IG. Since its launch in 2015, socialprotection.org has garnered more than 2,400 members, and provided access to over 2,900 publications. It has also organised 42 webinars and currently hosts 31 active online communities. Our colleagues and partners at socialprotection.org will host the webinar "The ISPA Public Works Assessment Tool: User Experiences from Tanzania", on 21 September. As part of the ISPA Webinar Series, this webinar will provide a presentation on the process of initiation, implementation, results, reception and impact of an ISPA assessment of the public works component of the Tanzanian Productive Social Safety Net (PSSN) programme. To register for this free event, please click here. IPC-IG's Research Associate Solange Ledi Gonçalves will be the keynote speaker at a seminar organised by the Institute for Applied Economic Research (Ipea) in Rio de Janeiro, on 20 September. Ms. Gonçalves will present the paper "Household job search and labour supply of secondary earners in the family”, which is one of the subjects of her thesis. 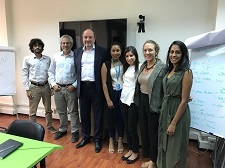 The IPC-IG participated in a mission to Cairo, from 1 to 16 September, as part of an ongoing study conducted by the Centre with UNICEF Egypt to review and enhance the child focus of the monitoring and evaluation system of the country’s Takafol and Karama cash transfer programmes. 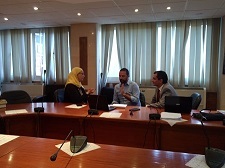 IPC-IG’s Senior Research Coordinator Rafael Osorio met with Egypt’s Assistant Minister of Social Solidarity, Dr. Nevine El-Kabbag, and the Chief of Social Protection at UNICEF Egypt, Dr. Peter Ragno, to discuss the ongoing work, main achievements and future plans of the project. He also delivered a presentation about the project during a meeting with the Development Partners Group, which brings together the main international agencies and institutions working in the country, such as UNICEF, the World Bank, the ILO, UNDP, FAO, the WHO, and AfD. An IPC-IG team travelled to Beirut from 17 to 30 August, as part of an ongoing feasibility study on means to enhance the child-sensitive responses of the country’s social protection system, with a special focus on its National Poverty Targeting Programme (NPTP), under the scope of a project developed in partnership with UNICEF. Mr. Sergei Soares, Ipea Researcher and IPC-IG Research Associate, and Mr. Pedro Arruda, IPC-IG Research Associate, presented the final study report. Both researchers provided technical details of the proposals presented in the report to the UNICEF team and to other important partners, such as the Ministry of Social Development (MoSA), the World Bank, the WFP, and the International Labour Organization (ILO). UNICEF's Regional Social Policy Adviser, Mr. Arthur van Diesen, also joined the IPC-IG team in this mission.